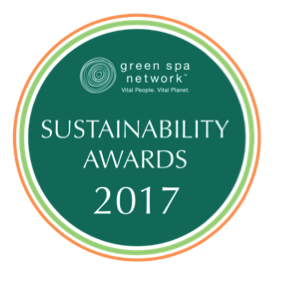 Atlanta, GA – (February 2018) – The Green Spa Network (GSN) announces its 6th Annual Sustainability Awards, which recognize innovation and leadership by the spa industry in support of a vital planet and vital people. With its annual awards, GSN celebrates the collective contributions to a more sustainable future. Representing both the spa and sustainability industries, along with wellness, hotels, and design, the 2017 GSN Sustainability Awards judges are well-known in the community and have a strong pulse on the change leaders. The independent panel will award winners in four categories: Sustainable Building, Innovative Sustainable Initiative, Leadership in Sustainability by a Day Spa and Resort/Wellness Center, and Sustainable Spa Brand in Beauty, Equipment, and Retail. The GSN Sustainability Awards program also includes a Visionary Award and the Tara Grodjesk Dedicated Contributor Award, which are determined by the GSN Board of Directors. The 2017 GSN Sustainability Judges are Rona Berg (Editor-in-Chief, Organic Spa Magazine), Julie Keller Callaghan (Editor-in-Chief and Publisher, American Spa Magazine), Debra Duneier (Founder, EcoChi), Glenn Hasek (Editor and Publisher, Green Lodging News), and Ulli Peck (Founder and Owner, The Wellness Agency). Our awards program celebrates those efforts that positively support building a sustainable future. Nominations were selected by the judges and recommendations were also submitted on the website. Entries were judged on sustainability, innovation, positive environmental and/or community impact, and financial impact. GSN aims to discover, recognize and celebrate significant accomplishments within the spa industry. LED light therapy is the application of specific wavelengths of light to tissue to obtain therapeutic benefits. Research has shown this to be an effective therapeutic avenue to promote the healing of skin wounds, decrease inflammatory cells, increase microcirculation and boost collagen and elastin synthesis. Complexion’s Celluma LED Light Therapy is quite unlike any other low-level light therapy device available today, as it delivers blue, red and near-infrared light energy simultaneously, to safely treat a wide variety of conditions. The science is backed by NASA research, and each wavelength is absorbed by different molecules which act as a signaling mechanism for different cellular processes. It’s perfect for anyone interested in decreasing wrinkles, improving skin tone, soothing acne or easing muscle and joint pain. Since LED light therapy triggers the flow of natural electrical and chemical systems in the body, healing effects will continue even after the light source has been removed and can create long-lasting results. Treatments are 20 to 30 minutes and are most effective when received regularly for four-to-six weeks. We offer them at a reduced price of only $35 per session when purchased as a series. Book directly, or call either of our locations to learn more. Want to see what it entails? Get a glimpse with this quick video! Listen to Denise Dubois’ interview on Talk 1300AM radio. 4.20.2016 – To celebrate Earth Week, Complexions is offering a 15 percent discount on one of April’s featured services. Schedule a Vitamin C Brightening Facial, a Therapeutic Massage, a Seasonal Pedicure, or a Master Barber Cut with Traditional Hot Shave during April 17-24 and receive a complimentary seedling tree to plant in honor of Earth Day. 12.11.14 – “Owner Denise Dubois said after being in the business for 26 years, she knew it was time to expand and Saratoga Springs seemed like the perfect spot. The 6,500-square-foot facility opened late September at the new 270 Broadway location in the Park Place at Broadway building. “We chose Saratoga Springs for the second Complexions Spa location based on its long history of health and wellness which makes it a natural fit for us. We also completed careful market research and analysis that helped us select Saratoga Springs,” said Dubois.Owner Denise Dubois said after being in the business for 26 years, she knew it was time to expand and Saratoga Springs seemed like the perfect spot. The 6,500-square-foot facility opened late September at the new 270 Broadway location in the Park Place at Broadway.” Read the full article here. “Turn back the hands of time and literally shock yourself in the process (don’t worry though, it doesn’t hurt, we swear). Dubbed “The Non-Surgical Facelift,” this Not So Freaky Halloween MicroCurrent Facial makes use of gentle, low level electrical currents to activate your body’s own natural skin enhancement chemicals, dramatically increasing the production of elastin and collagen and decreasing fine lines and wrinkles. Additionally, it can improve muscle tone in your face and neck, lift jowls and eyebrows, aid in lymphatic drainage and even enable your regular beauty products to penetrate your skin better. So go ahead, treat yourself.” Read the full article here. Latham, NY – The American Cancer Society is proud to recognize Denise Dubois, owner of Complexions Spa for Health and Wellness, as its Pillar of Hope at this year’s A Night in Tuscany. A Night in Tuscany is the American Cancer Society’s premiere summer event, which benefits HopeClub. Formerly Gilda’s Club, HopeClub provides a variety of services for those affected by cancer, their families and friends. This includes support groups, relaxation rooms, wigs and scarves and resources for the children’s playroom. Dubois will be honored for her commitment to the HopeClub’s Serenity Spa, which she helped establish in 2013. The Serenity Spa is a comfortable space where women can relax, receive massages, learn skin care tips and undergo scalp treatments to stimulate hair growth. Dubois and her dedicated staff host several spa nights throughout the year, donating their time and talents. “I am truly humbled to be this year’s Pillar of Hope, as the Serenity Spa is very special to me,” said Dubois. “My staff and I enjoy meeting with these amazing women and their families, learning their stories and helping them regain a sense of wellbeing.” Dubois has been a longtime supporter of the American Cancer Society and first became involved as a Look Good, Feel Good volunteer at the age of 18. In 2013 and 2013, she served as co-chair of the annual Gala of Hope. A Night in Tuscany will be held at Fasig Tipton on Thursday, July 24 beginning at 6 p.m. WNYT’s Jason Gough will serve as event emcee, catering is courtesy of Mazzone Hospitality and TS Ensemble will perform throughout the evening. For more information or to purchase tickets or make a donation, click here. FOR IMMEDIATE RELEASE: May 27, 2014 ALBANY, N.Y. – Complexions Spa for Beauty and Wellness in Albany, N.Y. is modernizing its traditional massage therapy with the addition of a Micro Quartz Heated Massage Table. The therapeutic sand bed, created by German wellness expert Gharieni, is based on the ancient Greek concept of ‘psammotherapy,’ which utilizes warm sand to purify the body of toxins, release muscle tension and alleviate pain. “This latest technology provides ultimate comfort for our clients and proves our dedication to helping our customers achieve overall well-being,” said Denise Dubois, owner. Complexions Spa is only the second spa in the country to offer clients the cutting edge spa technology. The heated sand table is ideal for massage treatments and body wraps and helps to diminish muscle pain, arthritic pain and stiff joints. Complexions created new wellness treatments that utilize the heated massage table; one such service is the Ancient Sands Therapeutic Massage, a sixty minute, ultra-purifying massage treatment that awakens the senses and renews the soul. The therapy employs the alpha-quartz sand to remove toxins, alleviate pain, reduce inflammation, improve stiff joints and pain, and promote relaxing comfort. Ancient Sands Therapeutic Massage can be enjoyed as a standalone service or add-on treatment. FOR IMMEDIATE RELEASE: May 7, 2014 ALBANY, N.Y. – Complexions Spa for Beauty and Wellness in Albany, N.Y., has been named Capital Region Living Magazine’s 2014 “Best Of” in the categories of Best Day Spa and Best Mani/Pedi. Additionally, Complexions made the list of top three finalists for the categories of Best Women’s Hair Salon, Best Men’s Barber and Best Massage. Capital Region Living Magazine’s annual survey recognizes people, places and local businesses in the Capital Region by public nomination in various categories. The winners of each category are determined by a popular vote. These “Best Of” awards are highly sought after for local businesses because their selection is made by customers they serve in the Capital Region. “I’m humbled by the recognition and thank my team for their commitment to providing the highest quality service and unique products and services in a soothing, eco-friendly environment,” said Denise Dubois, owner of Complexions Spa for Beauty and Wellness. “I further thank our loyal customers and the public who is responsible for this honor. It is both heartwarming and encouraging.” This is Complexions’ sixth consecutive year in ranking among the top finalists for Best Day Spa. To read more about Complexions’ recognition, as well as other area business winners, review Capital Region Living’s May issue. 4.21.2014 – Complexions Spa for Beauty and Wellness, an Albany salon with an upcoming second location in Saratoga Springs, continues its expansion with Giuseppe Silvestro, master barber. Silvestro is the newest master barber at the Complexions Barber Spa, certified through the Cationic Hydration Interlink Environmental School Program, which focuses on environmentally safe haircare products. In 2010, Silvestro moved from Sicily, Italy to the United States and has been avidly pursuing his barbering career ever since. He attended Austin’s School of Spa Technology in Albany where he received his master barber license. “I chose a profession in the barbering industry because I enjoy helping people look good and feel confident,” Silvestro said. Complexions Spa for Beauty and Wellness, established in 1987, is the nation’s first gold-level Leadership in Energy and Environmental Design certified new-construction spa. It offers a wide variety of traditional spa treatments and centuries-old beauty rituals from around the world using the finest natural organic products for men and women in an eco-friendly wellness environment. The spa works in conjunction with area plastic surgeons and dermatologists to develop healing treatments and post-operative recovery methods. It is a winner of several local, national and international awards for its service, design and philosophy on healthy lifestyles. Complexions Spa recently announced the development of a second location in Saratoga Springs. That 6,500-square-foot spa and salon will open in late summer at Park Place on Broadway next to Congress Park. FOR IMMEDIATE RELEASE: February 17, 2014 ALBANY, N.Y. – Complexions Spa for Beauty and Wellness will continue its commitment to rejuvenating the mind, body and spirit with the opening of a second location in the historic Saratoga Springs this summer. Known as the “Spa City” with its wealth of mineral springs, Complexions Spa at Saratoga Springs will harness the natural healing powers of Saratoga’s mineral waters. “We welcome Complexions Spa to Saratoga Springs as part of the long history of health and spas for which we are so well known,” said Joanne D. Yepsen, Mayor, Saratoga Springs. Complexions Spa at Saratoga Springs will offer an impressive array of soothing and therapeutic water treatments that not only feel good, but are good for you. “For centuries, people have soaked in mineral springs to reap the health benefits such as increased blood circulation, cell oxygenation, pain reduction and increased mobility,” said Denise Dubois, owner, Complexions Spa. “Complexions Spa at Saratoga Springs will truly be a destination of its own.” In addition to water therapies, Complexions Spa at Saratoga Springs will provide salon and retail services in the 6,500 square-foot property located at Park Place on Broadway next to Congress Park. The spa will be built to the same green standards as its premier Gold LEED certified facility in Albany utilizing recyclable, renewable and sustainable materials. Dubois will seek LEED certification for interior design and construction. Once completed, Complexions Spa at Saratoga Springs will employ nearly forty massage therapists, nail technicians, makeup artists, hair stylists, aestheticians and spa coordinators and is currently accepting employment applications. Click here to view the video of tanning with Complexions featured on WNYT! FOR IMMEDIATE RELEASE: April 18, 2012 ALBANY, N.Y. – Complexions Spa for Beauty & Wellness in Albany, NY, plans to continue its commitment to “green” practices by celebrating Earth Day, Sunday, April 22, with its clients by giving away tree saplings all week. This year marks the fourth consecutive year Complexions Spa has given away one-hundred tree saplings to its clients on Earth Day/Week to plant throughout the area. This makes for an impressive accomplishment; Complexions has now ‘sprinkled’ more than four-hundred tree saplings around the Capital Region. Each sapling comes with planting directions, as well as offers some simple “green” tips anybody can easily implement at home. The tree sapling give-away is just one way Complexions gives back to the environment. As a Gold- Level LEED Certified spa they also use low-energy lighting, energy-efficient appliances, low-flow toilets/faucets, eco-friendly detergents and paper supplies, an energy recovery ventilator, and more. Complexions’ greenhouse gas savings is estimated at 56 tons annually ─ equivalent to the level of CO2 emissions generated from the electricity use of nearly seven homes in one year. Additionally, Complexions saves an estimated more than $10,000 annually in their utility bills. Complexions will soon boast opening its newly constructed addition at 221 Wolf Road in Colonie; also being built to LEED certified specifications. When completed, the expanded spa will comprise nearly 11,000 square-feet in total, with an expanded hair salon, professional make-up area, and reception/lounge area. An outdoor relaxation room with a water feature will also be added, which is a seemingly exclusive feature to any spa in this area. “We like to think that every day at Complexions is Earth Day,” noted Denise Dubois, owner of Complexions. “We are extremely dedicated to a ‘green’ lifestyle, and hope other businesses are as well as there is so much we can do to help maintain a healthy environment that really does not take a lot of extra effort.” Complexions wants everybody to celebrate Earth Day and recognize its importance so they are celebrating all week rather than just one day (April 22-28) with some specially priced services, not to mention the free sapling give-away (while supplies last). For more information about Earth Day visit www.EarthDay.org. FOR IMMEDIATE RELEASE: March 8, 2012 ALBANY, N.Y. – Complexions Spa for Beauty & Wellness in Albany, N.Y., continues its expansion with new Salon Assistant/Apprentice Jessica Young. Young is a graduate of Paul Mitchell The School Schenectady. Young has also attained a Keratin Treatment Certification with Global Keratin. Additionally, she earned an educational trip of a lifetime with a Paul Mitchell sponsored trip to Las Vegas for several days to attend cutting, color and styling classes from Angus Mitchell and other renowned instructors. “We are pleased to have Jessica join our salon team,” stated Denise Dubois, owner of Complexions Spa for Beauty & Wellness. “She loves meeting new people, as well as helping them look and feel their absolute best.” Young resides in Rotterdam, N.Y.
FOR IMMEDIATE RELEASE: January 20, 2012 ALBANY, N.Y. – Complexions Spa for Beauty & Wellness, located in Albany, N.Y., breaks ground for a 2,300 square foot expansion at 221 Wolf Road. Once complete the spa will comprise of nearly 10,800 square feet in total. With this building expansion, Complexions will be able to accommodate special events and groups with a private area, while expanding the hair salon, professional make-up area, client reception/lounge area, and more. “This expansion will allow us to better serve our existing clients, as well as future clients,” said Denise Dubois, owner, Complexions Spa. “We conducted a focus group consisting of both clients and non- clients and they were very open, honest and truly instrumental to every aspect that went into the planning and designing of this 2,300 square foot expansion, and how the space will be utilized to enhance our guests’ spa experience.” The construction manager is A. Mantello Construction, in conjunction with Greco Construction, Inc., and was designed by Woodward Connor Gillies and Seleman Architects. The addition will allow Complexions to remain Gold LEED® certified. Complexions Spa is registered with the U.S. Green Building Council (USGBC) and was the first Gold LEED certified spa in the country for new construction. The new space is being constructed using the same eco-friendly (high-efficiency fixtures, materials, etc.) building criteria as when it was originally built. Complexions Spa first opened in 1987 and this is the first expansion to this location at 221 Wolf Road since converting the facility from a fabric store into an eco-friendly spa in 2008. The expansion is anticipated to be complete this spring, with an open house celebration soon to follow. The spa will not close, and there will be no interruption to client services, during the construction phase. FOR IMMEDIATE RELEASE: January 17, 2012 ALBANY, N.Y. – Complexions Spa for Beauty & Wellness in Albany, N.Y., recently added Kara Falzo as a master barber to its Men’s Barber Spa professional team. Falzo graduated from Colonna Cosmetology School in 1995 and perfected her razor skills by training with several ‘old-world’ barbers. She then traveled to Scottsdale, Arizona, where she became the first female barber at the prestigious V’s Barbershop. While there, she was recognized in an Arizona newspaper as giving “the best haircut.” Her clientele included Tom Chambers of the Phoenix Suns, and several of the San Diego Padres. Falzo’s travels then brought her to San Diego, California, where she was a barber on Camp Pendleton, Marine Corps Base. One of her most famous clients there was Four-Star General James “Mad Dog” Mattis. “We have assembled a great team here at Complexions Spa, and are honored to add Kara, and her talents, to our unique Men’s Barber Spa,” stated Denise Dubois, owner of Complexions Spa for Beauty & Wellness. “Her experience is exemplary, and we believe our male clients will be thrilled with her cutting and styling techniques.” Falzo resides in Niskayuna, NY. FOR IMMEDIATE RELEASE: January 3, 2012 ALBANY, N.Y. – Complexions Spa for Beauty & Wellness, located in Albany, N.Y., expanded its pedicure line to include a therapeutic pedicure by spa staff members that recently completed advanced training to become Certified Master PedicuristsTM. The new service will assist clients with foot calluses, cracked skin,fungus, and even those with diabetes as attention to foot care is essential to diabetics. The Certified Master Pedicurists (CMP), Marisela and Teresa Salinas, who also happen to be sisters, studied at the North America School of Podology and have been Complexions team members for more than a decade. Both also have more than 20 years each of education and experience in the industry. The CMP training included learning about the foot’s anatomy, body alignment, biomechanics, diseases and disorders for the skin and nail, and the implications of diabetes and chronic illness on pedicures. “As certified nail technicians, we wanted to take our education further so we could provide the best quality pedicures that will help our clients not only look better, but feel better,” said Marisela Salinas. “It’s common to overlook the care of your feet, which is important to our overall well-being. Our therapeutic pedicures can assist with maintaining the health of your feet, and are beneficial for both men and women,” noted Teresa Salinas. “Our new therapeutic pedicure is where medi (medical) literally meets pedi (pedicure),” said Denise Dubois, owner, Complexions Spa. “People may not realize that our lifestyle today can have a major impact on the health of the skin and nails on our feet. Our therapeutic pedicure takes foot esthetics to a whole new level. When your feet are healthy and feel good, you feel good!” In conjunction with this new therapeutic pedicure, Complexions is also proud to offer the FootlogixTM pediceuticals line of products in their retail area for clients to use at home. To learn more, join Complexions for a “Healthy Feet” Spa Party on Thursday, January 12, 2012, starting at 5:30 pm. Register by calling 518-489-5231. Complexions is proud to announce that we were able to recently donate more than $4,500 to the American Cancer Society in honor of Breast Cancer Awareness Month due to the support of our giving clients. Our team completed nearly 350 pink hair extensions, dozens of pink manicures, and we held “Pink Spa Party” in October where 100% of all proceeds benefited the American Cancer Society. Thank you everyone! FOR IMMEDIATE RELEASE: October 27, 2011 ALBANY, N.Y. – Complexions Spa for Beauty & Wellness, located in Albany, N.Y., is excited to introduce a new and innovative hair reduction system for both men and women called Epilfree. This new system is an affordable alternative option hair reduction treatment, and may work in cases where “traditional” hair removal methods are ineffective or not an option. Epilfree is the new generation of hair removal that combines simplicity of use, with exceptional pain-free results, all at an affordable price. It is a natural and scientific solution for unwanted hair, anywhere on the body, and is suitable for anyone with any hair color or skin type. Epilfree inhibits hair growth while nourishing skin cells. It only eradicates the cells that are involved with the hair dividing process, thus rendering them incapable of producing more hair, so your skin remains healthy and there is never the danger of skin pigmentation. “Here at Complexions, we’re always excited to explore new and natural methods to help our clients look and feel their best,” said Denise Dubois, owner, Complexions Spa. “This Epilfree hair reduction system, which works on the cellular level, will help clients with difficult hair removal issues, anywhere on their body, and has no side effects. It’s great for men or women, even teenagers, and is very affordable.” Epilfree is available to clients now by making an appointment at Complexions Spa. Click to listen to the interview. FOR IMMEDIATE RELEASE: August 1, 2011 ALBANY, N.Y. – On July 28, 2011, Denise Dubois, owner of Complexions Spa for Beauty &Wellness in Albany, N.Y., was honored at the third Annual Women in Business & Community Night sponsored by the Tri-City ValleyCats. Along with Denise Dubois, several other business women from the capital area were introduced as the ‘Women Making a Difference Starting Lineup’ before the start of the game at the Joseph L. Bruno Stadium in Troy on Thursday, July 28, 2011. Award recipients from categories including Lifetime Achievement, Woman Owned Business, Professional, Education, Non-Profit, Community Leader and Student, were recognized on the field for their efforts and achievements in their businesses and community. Dubois was nominated for this award due to her professionalism and her unwavering commitment to combining wellness services in a facility that supports the environment. Additionally, her community/volunteer service efforts include: the Alzheimer’s Association, The Salvation Army, Ronald McDonald House Charities, Saratoga Back Stretch Workers, St. Jude’s Children’s Research Hospital, Leukemia & Lymphoma Society, American Cancer Society, American Heart Association, and many more. Attendees enjoyed an hour of networking with food, drinks, and a commemorative 2011 Women in Business & Community Night gift. FOR IMMEDIATE RELEASE: July 26, 2011 ALBANY, N.Y. – Complexions Spa for Beauty & Wellness, located at 221 Wolf Rd. in Albany, N.Y., is proud to announce that they have added three brand new services available at the spa starting immediately. They are: Golf Ball Massage─A therapeutic massage incorporating the use of warm and cool golf balls for deep tissue manipulation to specific areas of tension, soreness, and chronic discomfort. This curative massage improves flexibility and mobility in the muscles to possibly help enhance your golf game. The SPAball is yours to take home for continued use. Wei Essence Massage─Mandarin for “transformative action,” this 60-minute soothing massage incorporates flower essences that you choose to create an immediate positive effect on your mood, state-of-mind and well-being. Based on the flower you visually select, specific organic oils and mists are used during the massage that will work with your body’s meridian system to enhance clarity, peace, and happiness. Wei Essence Facial─Also incorporating the use of flower essences that you choose, this facial is an excellent way to give your skin a refreshing look and feel. Complete cleansing, exfoliation, massage, hydration and custom mask are included. Your skin will be left with a beautiful healthy glow. Of note, the flower essences used in the Wei treatments are hand-collected from both wild-crafted and organic plants in secluded habitats where there is little human influence in the environment. “At Complexions we’re always researching and exploring new methods of healthy therapy treatments for our clients,” said Denise Dubois, owner, Complexions Spa. “We are thrilled to add the Wei treatments to our line with their organic balancing serums, energy mists and flower elixirs.” Although not guaranteed to improve your golf score, however, it can’t hurt, Complexions also has available for sale golf ball massage caddies which allow clients to enjoy self-golf ball massages at home. SARATOGA SPRINGS — Albany-based salon Complexions Spa for Beauty and Wellness will set up a branch at the Saratoga Race Course over opening weekend from Friday, July 22 until Sunday, July 24. The Complexions tent is located just outside the clubhouse near the entrance to the paddock. This weekend the spa will be offering a variety of salon and spa services for fans who want to unwind during a long day at the track. Complexions Spa is renowned for being the state’s first and only gold-level LEED certified new construction spa, a certification that guarantees green and energy-efficient services. The spa specializes in organic treatments and also works with plastic surgeons in the area to help develop individually-tailored skin-care and post-operation treatment programs for customers. Complexions Spa Owner Denise Dubois said she is excited to offer her services this weekend in Saratoga for both men and women who might not have the chance to visit their permanent location in Colonie. The Complexions tent will offer traditional hot shaves and neck trims for the men, chair massages, make-up touch ups, eyelash strip applications, nail polish changes and hair styling. In addition, guests will be able to browse racing-themed fashion accessories and jewelry for purchase while they enjoy their spa service. Dubois announced that Complexions will also hold a drawing on opening weekend with the grand prize being a day of full-service pampering at the spa valued at over $300. Another perk is that each visitor who comes to the tent will receive a $10 gift card for use at Complexions Spa located on Wolf Road in Colonie. Posted by Suzanna K. Lourie in The Saratogian Blog. FOR IMMEDIATE RELEASE: July 20, 2011 Complexions Spa for Beauty & Wellness in Albany, NY, has headed north to the Saratoga Race Course for the track’s opening weekend (Friday, July 22─Sunday, July 24) of this summer’s racing season. All thoroughbred enthusiasts will be able to indulge in some of Complexions’ unique and relaxing spa services right at the track to help them look and feel their best. Complexions Spa is offering several spa services in the Saratoga Style Tent conveniently located outside the Clubhouse, next to the Paddock entrance, where both men and women can enjoy a bit of pampering. “We are very excited that people who may have not yet visited our spa in Colonie now get a chance to experience some of our great services while enjoying their day at the track,” noted Denise Dubois, owner, Complexions Spa. “There is something for everyone under the tent, and we are looking forward to providing men and women alike with a spa service they probably have not experienced at a world-famous horse track before─what fun!” Some of the services being offered include chair massages (including their brand new golf ball massage), traditional hot shaves and neck trims, make-up touch-ups, eyelash strip applications, nail polish changes, and hair styling and up-dos. Equestrian-themed accessories, fashion items, and jewelry will also be available for purchase. Complexions Spa, located at 221 Wolf Road in Colonie, will remain open for business as usual. To add to the excitement, Complexions will holding a drawing that weekend where one lucky track-goer will win a day of pampering at the spa, valued at more than $300. Additionally, each visitor who stops by the tent will be given a $10 Gift Certificate to use as they want at Complexions Spa on Wolf Road. FOR IMMEDIATE RELEASE: April 11, 2011 ALBANY, N.Y. – There’s Something New at Complexions Spa, and it Seems to be in the Water! Dating back to the ancient Romans and Greeks, bathing rituals and ceremonies performed in water were thought to purify the body and mind. Complexions Spa for Beauty &Wellness in Albany, NY, stays true to its belief in health and healing through water by announcing spa-wide use of a new water technology, exclusive to the Capital Region at Complexions Spa, called Transcutaneous Oxygen Therapy. The process, in which water is infused with large amounts of oxygen that enters the skin thus bringing elevated tissue oxygen levels (350 percent) immediately, is clinically proven to: • destroy bacteria and fungus • reduce inflammation • detoxify • help reduce fine lines and age spots • invigorate fatigued muscles while increasing energy/vitality and circulation • diminish symptoms of psoriasis, eczema, diabetic sores, and acne Oxygen is universally recognized for its significant health benefits as it’s a powerful detoxifier and a key ingredient in natural age defying therapies. This healing water has recently been incorporated into all skin care and body treatments, manicures, pedicures, hydrotherapy tubs, spa steam rooms, as well as all of Complexions Spa’s drinking water. The professional oxygenation systems were provided by virtue of Oxygen Pur Spa®. Visit them at www.oxygenpurspa.com. To sample some of the health benefits of this cutting-edge oxygenated water, the public is invited to visit Complexions Spa on Thursday, April 14th, between the hours of 5:30 and 9:00 pm for a “Healing Water” SPArty. Enjoy a complimentary foot soak, a chair massage, an herbal facial cleansing with an application of the patented oxygenated skin serum, and free use of the steam rooms now using oxygenated water. Call the spa at 690-0616 for more information and to make a reservation. “At Complexions, we are always looking to stay ahead of the curve with the latest innovations and treatments to provide our customers with only the best products and services, and to help promote a healthier lifestyle,” said Denise Dubois, Complexions Spa owner. “This latest oxygen-infused water technology further proves our commitment and dedication to our clients’ overall health and wellness.” To fully experience the benefits of this oxygenated water, Complexions offers a new, exclusively designed treatment properly named, “Fountains of Youth.” This three-hour treatment immerses your body in oxygenated water pulsating from jets in a musical-like rhythm penetrating deep through the skin, tissues and into the bloodstream. The water’s healing benefits jump into action eliminating toxins and stress, and leaving your body cleansed inside and out. The treatment also includes ‘cupping,’ in which small suction cups are used to balance and improve and unblock the flow of qi, or life energy, which travels throughout the body in channels called meridians. Additionally, clients are provided with salts and oils to use at home as part of the follow-up treatment. Lastly, Complexions will also be offering a patented oxygenated skin serum that harnesses the healing power of dermal oxygen transfer clients can use at home. As part of a daily regimen, this serum delivers the benefits of oxygen to skin cells and optimizes cell repair to keep skin looking radiant by regenerating and visibly toning skin tissue. It reinforces the therapeutic effects of professional treatments by also reducing fine lines and age spots and rejuvenating the complexion. FOR IMMEDIATE RELEASE: March 18, 2011 ALBANY, N.Y. – Complexions Spa for Beauty &Wellness in Albany, NY, is proud to announce that it was voted in the top as “Best Day Spa” recently in Metroland’s Readers’ Choice Poll 2011. Every year Metroland conducts this Readers’ Choice Poll, which includes everything from best area restaurants, to best bands, then calculates and compiles all votes, and announces the top three winning businesses in each category based on their readers’ responses. “We are honored to be named in Metroland’s Readers’ Choice Poll as it’s very important to us that people in this area think of Complexions as a day spa of choice,” said Denise Dubois, Complexions Spa owner. “Every day we strive to provide top-notch spa services and products to our clients with fine detail paid to customer satisfaction. This award illustrates that those efforts have been noticed by the great people in the Capital Region.” For more information about Complexions, and their full list of products and spa services, visit their website at complexions.local.